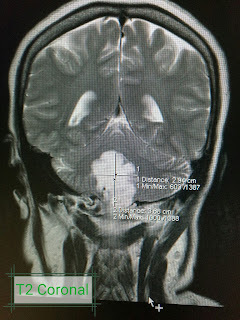 A 52 years old men has a finding of Brain tumor or compatible with intracranial, and calvarial metastasis, with leptomenigeal in the brain. 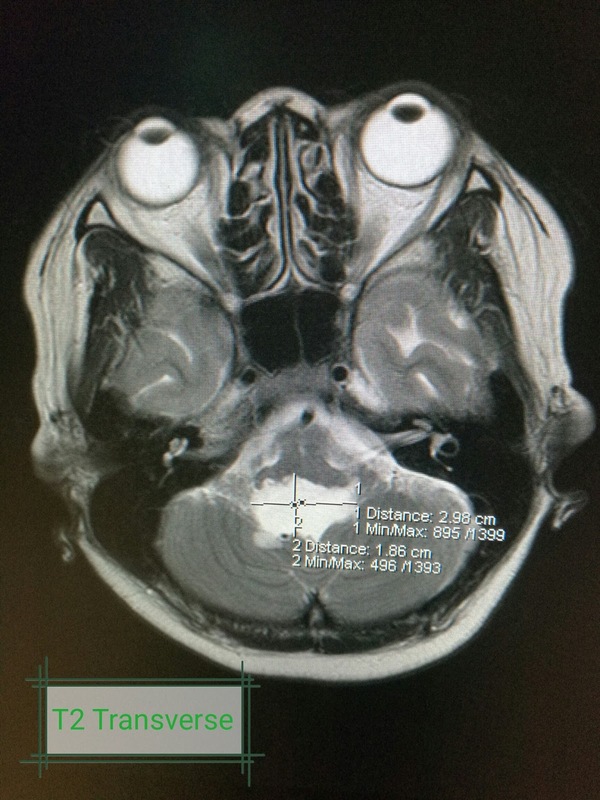 Midline shift or subfalcine hernation by 0.7cm to left, Mild ethmoid sinus disease sinusitis or its sequela and has a bilateral mastoid disease. MRI of the brain scan with Gadolinium reveals that a heterogeneously enhancing, lobulated mass, exhibiting perilesional edema is seen in the right temporoparietal region, measuring approximately 3.4 x 3.9 x 4.8 (craniocaudal x tranverse x anteroposterior dimensions). A similar looking mass is demonstrated superiorly in the right high frontoparietal region, measuring 3.1 x 3.2 x 3.1 cm. An enhancing focus is also noted in the superior aspect of the left frontal bone, near the vertex measuring approximately 1 x 2.5 x 1.9 cm. In addition, leptomenigeal seeding is considered in the posterior temporoparietal convexity, and adjacent cerebellar convexity. 0.7 midline shift / subfalcine herniation is noted to the left. There is uncal fullness noted on the right. The rest of the cerebral sulci, lateral and cerebellar fissure are unremarkable for the patient's age. There is slight compression of the occipital horn of the right lateral ventricle. The rest of the ventricles are not dilated. The sella is not widened. The frontal sinuses are hypoplastic, bilaterally. Minimal T2WI hyperintensities are seen in the posterolateral aspect of the mastoids. The rest of the paranasal sinuses are intact. A 49 years old has a MRI diagnostic results of a Cystic brain tumor in the expanded 4th ventricle as described, for which epidermoid cyst or tumor is primarily considered minimal microvascular white matter ischmic changes. Mild ethmoid sinus disease or sinusitis or its sequela. 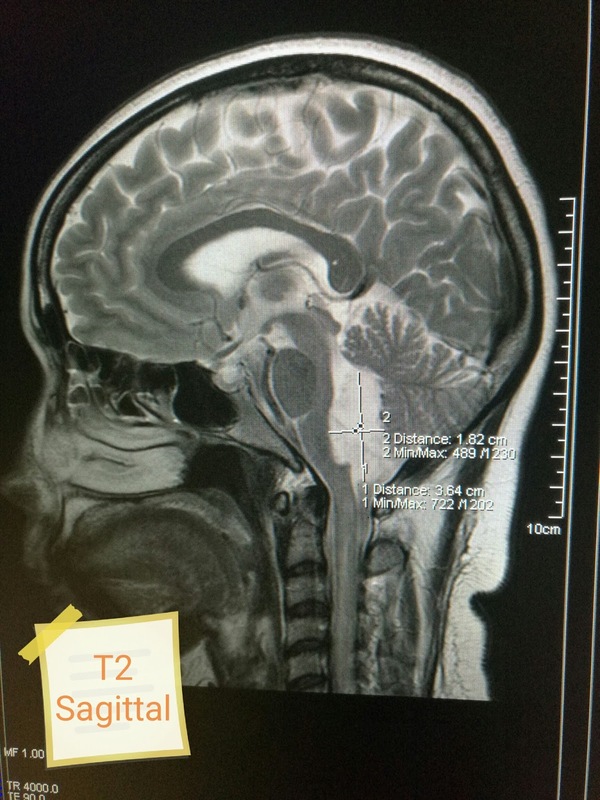 A lobulated T2WI hyperintensity with no significant enhancement is seen in the expanded 4th ventricle, measuring approximately 4.5 x 2.6 x 2 cm (craniocaudal x tranverse x anteroposterior dimensions). 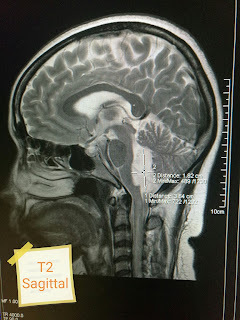 It is intimately related to the dorsal aspect of the anteriorly displaced brainstem, predominantly to the posterior aspect of the medulla oblongata, and to the ventral surface of the posterior displaced cerebellum. There is no acute infarction noted. There is no hemorrhage appreciated. Minimal microvascular white matter ischemic changes are seen in the periventricular regions, corona radiate centrum semi oval, frontoparietal subcortical regions. Few prominent perivascular spaces are considered in the basal ganglia, bilaterally. The cerebral sulci, lateral and cerebellar fissures are intact. The rest of the ventricles are not dilated. The pituitary glands is not enlarged. The right frontal sinus is aplastic, while the left frontal sinus is hypoplastic. The rest of the paranasal sinuses, and mastoids are intact. There is no other remarkable finding. 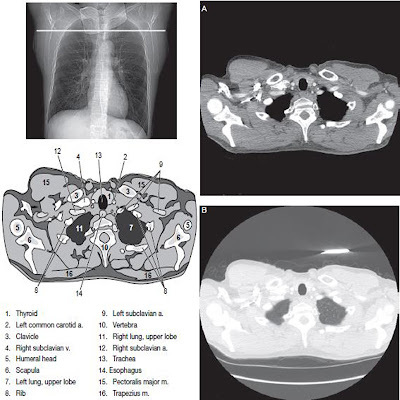 Disclaimer: The radiology findings are not diagnose by the author but it is translated by a registered Radiologist. All information above are for educational purposes only.